The history of the Chelsea Porcelain company, its products and its anchor mark periods. The Chelsea porcelain factory was founded in 1743 by two Frenchmen; Charles Gouyn a goldsmith and Nicholas Sprimont a silversmith. Its early soft-paste porcelain products were aimed at the aristocratic market. The first director Nicholas Sprimont was a silversmith by trade, but few documents survive to put together a comprehensive picture of the manufactorys history. Nicholas Sprimont and Charles Gouyn remained partners in the firm until 1749, when Gouyn retired and Sprimont became the sole owner of the company. Early porcelain tablewares were produced in bulk by 1750, and were bases on meissen porcelain models and on silver prototypes, such as salt cellars in the form of realistic shells, for inspiration. 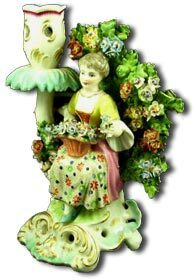 Chelsea porcelain is also well known for its figures and from about 1760 its inspiration was drawn more from the French company Sevres porcelain than from Meissen. During the anchor marks periods Nicholas Sprimont was the ruling force at the Chelsea factory. In 1763, due to illness he put the factory up for sale. In 1769, the Chelsea factory was purchased by James Cox, who then resold it in 1770 to William Duesbury, who owned the derby porcelain factory. Nicholas Sprimont died in 1771. Porcelain wares were marked with a combination mark formed from the Chelsea anchor mark and the Derby D mark. 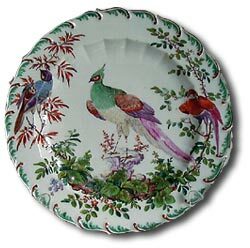 The first wares produced are generally indistinguishable from other Derby porcelain wares and this period is generally called the Chelsea-Derby period. The merger lasted until 1784, when the Chelsea factory was demolished and its moulds, patterns and many of its workmen and artists where transferred to Derby. William Duesbury continued to grow his small porcelain business and in 1775 his hard work was rewarded by King George III. The King awarded Duesbury the rare honor of being allowed to incorporate His Majesty’s Crown into the Derby backstamp. The company then became known as Royal Crown Derby. In 1786, William Duesbury died. The Chelsea-Derby company was passed to his son, William Duesbury II, who was educated and raised close to the porcelain business. William II made an excellent leader and he developed a number of new glazes and body types, but unfortunately, he died in 1797 at the young age of 34. The company then passed to Michael Kean, who was unable to maintain standards and the derby reputation and name began to decline. It was during Michael Kean’s period that many well known and highly regarded artists left in pursuit of other opportunities. Early products bore an incised triangle mark. Most of the wares were white and were strongly influenced by silver designs. The most notable products of this era were white salt-cellars in the shape of crayfish. The most famous pieces are perhaps, the Goat and Bee jugs c1747, that are also based on a silver model. Copies of the goat and bee jugs were made at Coalport in the 19th century. From 1750 to 1758 the chelsea porcelain company was under the royal protection of William Augustus, Duke of Cumberland and second son of George II. The Duke’s secretary, Sir Everard Fawkener, influenced and supported the factory’s output until his death in 1758. It was during this period that the anchor marks were introduced at the Chelsea factory. During this period, the paste and glaze were modified to produce a clear, white, slightly opaque surface on which to paint. The influence of meissen is clearly seen in the classical figures among Italianate ruins and harbour scenes and adaptations from Francis Barlows edition of Aesop’s Fables. In 1751, copies were made of two meissen services. During this period the marks were applied in red. The Red Anchor period was strongly influenced by meissen and is regarded as the peak period of English porcelain. The fancy wares known as chelsea toys are famous, particulary the scent-bottles in the form of little painted figures. Kakiemon subjects were popular from the late 1740s until around 1758, initially inspired by the original Japanese porcelain and then by meissen and chantilly. Some English-inspired tableware decorated with botanically accurate plants, copied from The Gardner’s Dictionary c1752 were also produced in this period. In this period, Chelsea Porcelain mainly followed the style of the French Sevres company. The gold anchor mark is the most forged Chelsea mark. As gold could not take the high temperatures in the kiln, the mark had to be applied on top of the glaze, which was a perfect mark for forgers as they did not have to mess around with the glaze. The influence of Sevres was very strong and French taste was in the ascendancy. The gold anchor period saw rich coloured grounds, lavish gilding and the nervous energy of the Rococo style. These included bonbonnières, scent bottles, étuis, thimbles and small seals, many with inscriptions in French.